Description: Promotional flyer handed out at certain video game retailers advertising the game and special contest. Customize your very own AC and submit your artwork on either a memory card compatible with the PlayStation® game Console or video tape with your official registration card and get a chance to win $500.00. Contest ends December 11 1998. For more details, visit www.asciient.com or call (650)780-0166. Welcome to the newest edition in the Armored Core series; Armored Core: Project Phantasma. Blaze a path of destruction and devastation through enemy lines, take out secret installations, and pit yourself against the biggest and baddest ACs you've ever seen. Fully customize your AC with monster weapons and insane parts. Choose options such as missions, shop, e-mail, garage, and multi-player compatibility. 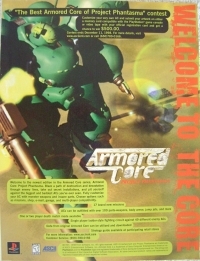 This is a list of VGCollect users who have Armored Core: Project Phantasma Promotional Flyer in their Collection. This is a list of VGCollect users who have Armored Core: Project Phantasma Promotional Flyer in their Sell List. This is a list of VGCollect users who have Armored Core: Project Phantasma Promotional Flyer in their Wish List.